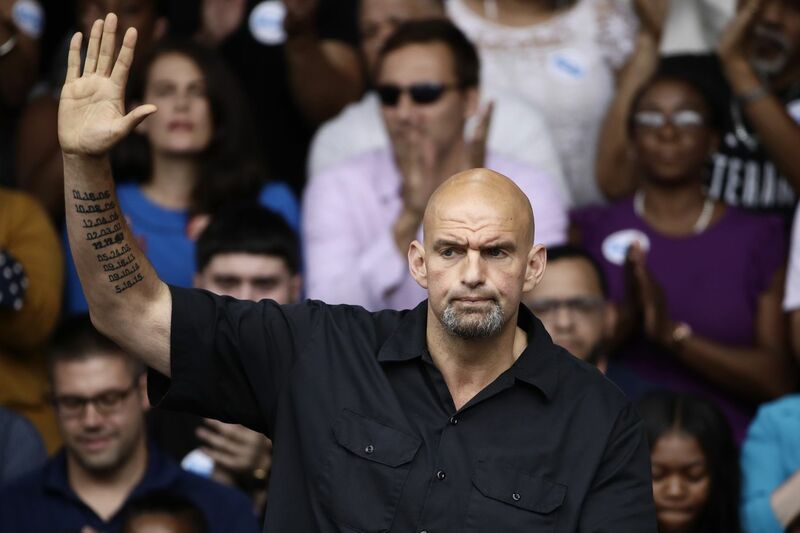 John Fetterman, displaying a tattoo showing the dates when people were killed by violence in Braddock, is moving to a more sedate job in Harrisburg. HARRISBURG — Not so long ago, John Fetterman was spending his days trying to reverse years of poverty, inequality, and urban blight in the small steel town where he was mayor for more than a decade. His unconventional approach to turning the town’s fortunes around made him a national media darling well before he ran for statewide office. “Mayor of Hell,” a Rolling Stone headline declared early in his career, documenting his attempts to “save” Braddock, Pa., population 2,100 and change, a wisp of a town 15 minutes outside Pittsburgh but millions of miles away in terms of its fortunes. Recreational marijuana in Pennsylvania? Not so fast, says GOP. Now, Fetterman is about to step into one of the most conventional — and, in terms of politics, forgettable — jobs in state government: lieutenant governor. In Capitol political circles, it is not-so-jokingly referred to as the best gig in the state, because it comes with all the trappings of power — a house, a staff, a car, and a driver — but a fraction of the work. As his inauguration day approaches next week, the question for Fetterman, whose resumé includes TED talks and an appearance on The Colbert Report, is: Will it be enough? In a recent interview, the onetime Democratic mayor downplayed any suggestion that the job may not rate compared with the intensity of his most recent government post. Being lieutenant governor can be a lonely, if lucrative, job. In terms of the work, there are two set duties under the state constitution: chairing the Board of Pardons and presiding over the state Senate. The former meets roughly four times a year, for several days at a time; the latter convenes from 50 to 70 days of the year, sometimes with long stretches in between. And lieutenant governors are always on standby in case they need to step into the governor’s job, as was the case when Lt. Gov. Mark Schweiker took over after 9/11, when Republican Gov. Tom Ridge was named the first director of the Office of Homeland Security. For that, the job pays $163,672. Still, lieutenant governors can play big roles in a governor’s administration, and historically have. It is easier when the two get along, less so when their relationship is strained, as it was between Wolf and outgoing Lt. Gov. Mike Stack III. Despite that chilly relationship, Stack managed to carve out a niche, helping to streamline the pardons process and educating former offenders on clearing their criminal records and easing their path to employment. “The lieutenant governor feels very strongly that the man makes the job,” said Stack spokesperson J.P. Kurish. Yet it’s a far different post than the one Fetterman, 49, just left. Though he had his detractors, the onetime AmeriCorps volunteer spent 14 years trying to get the world to look at and confront the problems in his hardscrabble town — but also look beyond them. He started after-school youth programs, launched college scholarship and urban garden projects, and lured edgy new businesses to vacant buildings and lots. Along the way, the job became deeply personal. The zip code of Braddock is tattooed on one of his arms; the dates of the nine murders that occurred while he was mayor are inked on the other. So it came as little surprise when Fetterman said that he and his family won’t be leaving Braddock for the taxpayer-funded residence outside Harrisburg where previous lieutenant governors have stayed. Instead, Fetterman said last week, he is renting an apartment within walking distance of the Capitol. Though he will accept a state police detail, he doesn’t want the expense account that comes with the office — something that became an issue during Stack’s tenure — and it doesn’t appear that he wants much of the office’s support staff either. And despite his proclivity for comfortable clothing, he doesn’t plan on bucking the state Senate’s strict blazer-tie-trouser dress code for men when he presides over the chamber. “I can’t do anything about my looks. I’m not a matinee star,” he said. He cuts an imposing figure. Much ink has been spilled on his height (6-foot-8), his clothes (often a Dickies shirt with jeans or shorts), his tattoos, and his shaved head. His politics (unabashedly liberal) and political backstory (a finance major and Harvard master’s holder turned AmeriCorps volunteer turned Braddock mayor) have also been a source of almost curious fascination among the political elite. Pollster and political analyst G. Terry Madonna said one of Fetterman’s biggest challenges may be not stealing the spotlight in a button-down town. Yet, Wolf, who during last year’s campaign was known to jokingly introduce himself as “John Fetterman’s running mate,” is widely expected to assign Fetterman to work on challenging policy issues. In an interview Thursday, Wolf said one of those issues will be to survey the landscape on whether to legalize recreational marijuana. Last month, during a Twitter town hall, the governor said he believed it was time for the state to take “a serious and honest look” at the issue. It made headlines almost instantly, as Wolf had previously taken the position that Pennsylvania, which legalized medical marijuana less than three years ago, was not ready for that step. Fetterman has long supported legalization. Wolf on Thursday downplayed any rush, but said he believed Fetterman would be well positioned to take the state’s pulse, “in an informal way,” on the issue. And though he is widely expected to make another run for U.S. Senate in 2022 (he was unsuccessful in his first bid in 2016), Fetterman said his focus is on the present. “This is all about getting things done now,” he said.